Since its bloody and violent birth in 1971, Bangladesh’s history has been pronounced for political assassinations and military coups than reasons of development the country so richly deserves. Certainly, there still remain deep religio-political differences among the people. The main conflict is between right wing elements who continue to strive for Sharia law, discrimination against women and minorities and spiritual regression on the one side, and the progressive and liberal section of the population especially the educated youth who want jobs, progress and development. After 2008, there has been some forward movement. Social indicators have improved. Economic growth reached 7%. International stature moved from ‘near a state sponsor of terrorism’ in early 2002 to “a frontline state against terrorism” in the last two years. Bangladesh began to be cited internationally as an example among developing countries. Women’s emancipation in Bangladesh under the present government is the highest in the region despite opposition from right wing political parties and groups. Of course, everything has not been wonderful. Corruption has sapped the energy of the government in various areas and impacted development efforts. There are many other problems. But the country attained escape velocity to break the gravitation pull of under development. The nation, however, remains threatened by the festering wounds of the 1971 war of liberation and the crimes against humanity committed not only by the occupying Pakistani army but by Bangladeshis who joined the Pakistanis in perpetrating atrocities against their country-men and women. It is no longer argued that these atrocities did not happen, though no money or effort was spared by interested parties to obliterate them from living memory and history books. The evidence is too strong. An ingenious approach to downplay the impact of the 1971 genocide seems to be in the works. The Economist, UK (Dec. 15th 2012) wrote “It was very late to begin the search for justice, for the accused as well as victims”, but conceded that war crimes are subject to no statute of limitation. The weekly further said in the same article “The main perpetrators are not in the dock, since they are either dead or living in Pakistan. But some suspects are still leading prominent lives in Bangladesh”. In an internet posting by the Bangladesh Jamaet-e-Islami (JEI) international (Dec. 24, 2012) of which the writer is a recipient, The Economist is profusely thanked. The posting starts with the following sentences “Initiated by The Economist, the global media have now kindly exposed the myth behind the so called free, fair, just, transparent, international standard and not politically motivated trial as shamelessly claimed by the government (current government in Bangladesh) and all its political and ideological agencies, allies and cohorts” The Economist suggests that without the exposure it has made, the people would have remained in the dark about the machinations of the Awami League (AL) led government. The current controversy is related to the conversation of Justice Mohammad Nizamul Huq, Chairman of war crimes Tribunal-I with an expatriate Bangladeshi lawyer based in Brussels, Ahmed Ziauddin. Justice Huq was discussing the trial and revealed that the government was pressing for a verdict against one of the offenders before December 16, the day the Pakistani army surrendered in Dhaka. Judges all over the world do research, but discussing the case in hand is not ethical. The Economist had access to these conversations as had the Bangladeshi vernacular daily Amar Desh. Both published the conversation between Justice Huq and Ziauddin. Justice Nizamul Huq resigned, as he should have. The other question, however, is whether the Huq-Ziauddin conversation was privileged? Who hacked into the conversations over e-mail, skype, u-tube or whatever else? This is illegal, and suggests that a well funded network is working to illegally penetrate the internal proceedings of the court, the judges and the prosecution. The demand that the trials of Tribunal-I start ab initio is unfounded. The erring judge has stepped down. The trial must go on from here according to the rules laid down. The first accused in this trial is Dilwar Hossain Sayeedi, a top leader in the JEI, and one of the cruellest activists in 1971. Sayeedi is the dominant ideologue of the JEI who openly supports the extreme Wahabi ideology of the Al Qaeda and Taliban and has two options for minorities, that is, either convert to Islam or be prepared to be eliminated. Those who emphasize “injustice in Bangladesh” should take a short break and examine how the minorities in Bangladesh especially the Hindus, have suffered at the hands of the Islamists they are trying to defend, and how the minority population has declined from 18 percent in 1970 to barely 10 per cent today. The manner in which the JEI international has presented The Economist’s contribution to their cause needs deeper research than this article can present, because of shortage of space. But the common cause made by the two raise serious questions. It is more than obvious that efforts are afoot to scuttle the war crimes trial or shift it to after the year end general elections, in the hope that the Awami League led government would not return to power. The arguments put forth by the anti-war crimes proponents are neither legal nor moral. A dangerous game is being imposed on this region. It is becoming increasingly evident that The Economist has wittingly or unwittingly become a powerful communication tool of a much larger conspiracy that aspires to subvert the secular character of Bangladesh. The bigger concern is that the India led economic development and social stability in South Asia may be the bigger target. This writer would like to be corrected if he is wrong. Attention of readers is drawn to two issues of The Economist of July-August, 2011 (SAAG Paper No. 4665, 25 Aug. 2011). India was projected as a regional thug executing negative policies towards its South Asian neighbours, shooting Bangladeshi cattle smugglers, cozying up to Myanmar’s dictators, prosecuting conflicting relations with Sri Lanka and meddling “madly” in Nepal’s internal affairs, concluding New Delhi lacked any kind of vision. In its excitement, the weekly, perhaps, exposed its intention of going for the kill when it alleged that the Awami League won the 2008 elections in a land slide victory with “bags of Indian money and advice”, when international observers verified that this was Bangladesh’s fairest elections ever. The Economist went ahead to second the opinion of the Bangladeshi opposition parties campaigning against giving India land corridor facility to its North East, as it would annoy the Indian insurgents if military transportation were to take place. Astonishing! Was this weekly supporting Indian insurgents getting support from and sanctuary in Bangladesh as had happened openly during the BNP-JEI four party alliance rule in 2001-2006? This weekly must answer and explain. It even tried to ridicule the Awami League led Bangladesh government honouring the late Indian Prime Minister Indira Gandhi posthumously for her contribution to Bangladesh’s liberation. The Economist’s approach is confounding. It appears to condemn the independence of Bangladeshis suffocated under Islamabad; it tries to brush aside the genocide unleashed by the Pakistani army, the Bangladeshi Razakars, Al Badrs and Al Shams (together forming Jamaat-e-Islami of Bangladesh – at least two Pakistani army officers who witnessed the genocide have written about it in their memoirs); it accuses the government of decimating the Islamic political party, the JEI, among others. After Bangladesh attained independence, the JEI, (Pakistan army’s and ISI’s surrogate) was banned and the citizenship of its Amir, Golam Azam rescinded. It was rehabilitated when Gen. Zia-ur-Rehman became President and formed the BNP in 1978, and a relationship was established between the BNP and JEI. Zia’s wife Begum Khaleda Zia became the chairperson of the BNP after Zia’s assassination in 1981. Complicating matters further, Turkish President Abdullah Gul called on Bangladesh President Zillur Rehman for clemency for the war crimes accused. In a letter, (Dec. 23, 2012) to the Bangladesh President, Abdullah Gul pleaded that the accused Jamaat-e-Islami leaders were too old to stand trial, and apprehended that the trial may lead to civil war in the country. A 14-member delegation from the Turkish NGO Cansuyu Aid and Solidarity Organization visited Bangladesh, met opposition leaders and visited the Tribunal-I court, accompanied by the Turkish ambassador in Dhaka. The delegation misused visa on arrival meant for tourists and business delegations and indulged in political activities. 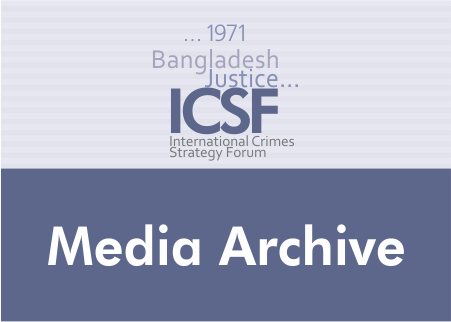 The Bangladesh government firmly rejected the Turkish overtures, but it was a case of gross interference in the internal affairs of a sovereign country and, that too, in favour of criminals accused of crimes against humanity. Most of these accused have links with Islamic terrorists in Bangladesh. President Gul’s plea that most of the accused are old and not fit for trial is misplaced. Only Golam Azam, former Amir of JEI, is 90 years old. The rest who held either ministerial positions in the BNP-JEI government or high level position in the party, are very active publicly. Although the Tribunal has the power to sentence a proven criminal to death, it is not necessary that this will be done. The lapse of time between the acts committed and the trials is not an issue. War crimes are not bound by the statute of limitation. The Nuremburg trials continued till all noted Nazi war criminals were accounted for. The age of the criminals were considered. In Cambodia/Kampuchea, the Khmer Rouge leaders who exterminated almost a fourth of the country’s population during their bloody rule in the 1970s have not been spared either. What is Turkey’s game plan? It is a member of NATO and is expected to be liberal and secular. From a once secular state Turkey has shifted to a more Islamist orientation. The ruling Justice and Development Party (AKP) to which President Gul and Prime Minister Recep Tayyip Erdogan belong is generally described as Islamist rooted and of Islamic leaning. Turkey is also the current chair of the Organization of Islamic Conference (OIC). But that does not mean it is part of AKP’s social, moral and religious duty to try and save criminals who committed crimes against humanity in a distant country just because the Jamaat is involved. What made President Gul intervene in Bangladesh? Is the AKP trying to save the JEI who want Sharia law to be introduced in Bangladesh and put women behind burkhas and within the confines of the house? Does the AKP have such a plan for Turkey? Or is there a much larger conspiracy to demolish the development of the region. Both The Economist and the Turkish government seem to have conveniently avoided any consideration of the sudden spurt of Islamic fundamentalist terrorism led by groups such a Jamatul Mujahidin Bangladesh (JMB), Harkat-ul-Jihad Islami (HUJI), Ahle Hadis, Hizbut Tehrir and others between 2001 and 2006. There are over 120 such fundamentalist terrorist groups in Bangladesh. Funding came to them from Islamic NGOs in Saudi Arabia, UAE, Pakistan and some other countries. A group of Al Qaida cadres were spotted in the jungles of Chittagong Hill Tracts in December 2006, hosted by the JEI. They fled after the BNP-JEI government fell. It is imperative that the international community revisit the roles of the gentlemen facing war crimes trial and some BNP leaders in promoting terrorism and political assassination between 2001 and 2006. If a moral issue is being cited, then the entire series of developments must be revisited. The last question is why involve India? It is well known that in some capitals of the world Sk. Hasina is seen as an obstructionist to influence mongering. India is perceived as the large neighbour which is promoting Sk. Hasina and her government to a trans-Asia development connectivity. This is not a case of a simple regime change in Bangladesh. A very serious risk is being taken by the powers and forces that be, to convert the country into a puppet of a new great game without even thinking that the strategy might blow up in their faces. As in Alice in Wonderland, the situation is getting “curiouser and curiouser”.